After studying Idiot Bosses for nearly two decades, I finally understand why females in certain species eat their young. The experience of working for an Idiot Boss is so universal and the feelings of frustration so widespread that the mere mention of this book title resonates throughout the human race. It does not resonate, however, with Idiot Bosses (code name: �I-Bosses�), not because they take exception to the name-calling and innuendo, I-Bosses just don�t get it�any of it. I once failed miserably trying to market a seminar titled, �How to Manage People who are Smarter, More Talented, and Productive than You Are�. My mistake was advertising to Idiot Bosses that needed the seminar. If I had advertised to people who could anonymously enroll and send their Idiot Bosses, I�d be a multimillionaire. 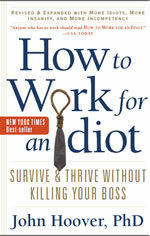 How to Work for an Idiot might not be a seminar to which bosses will eagerly send their employees, but as a book, the potential audience of highly motivated revenge seekers is huge and as ubiquitous as toilet paper. Okay, toilet paper is not technically ubiquitous; not in the same way as, say, oxygen. There is a large segment of the world�s population with little or no access to toilet paper. However, I really don�t expect those with little or no access to toilet paper to go online and order this book. On the other hand, if each person on earth who does have access to toilet paper buys a copy of this book, I might earn enough royalties to pay off my student loans. Speaking of eternity, on the seventh day, God relaxed and thought back over the productive week He had just completed. Suddenly remembering that He forgot to fix the Idiot Boss malfunction, God winced and said, �oops.� Not feeling the problem was annoying enough to create an eight-day week, God let the idiot thing slide, and the rest is history. Then again, God doesn�t have to work for an idiot. Idiot Bosses are the mutant hiccups of organizational evolution, with cockroach-like immunity to calamities that wipe out truly talented and creative people. Although idiots are barnacles on the ship of executive survival, they can nonetheless serve valuable functions�as long as they�re not in charge. The bad news is they usually are in charge. The good news is talented and dedicated people can rise above the situation and thrive in spite of their I-Bosses. If How to Work for an Idiot doesn�t provide you with the knowledge and awareness to deal with this vertical mobility challenge, it might at least keep you from going postal. Nearly everyone now works or has worked for an I-Boss. Despite the liberties this book takes with archetypal Idiot Bosses in the tradition of Dagwood�s Mr. Dithers or Dilbert�s despicable department head, it also suggests some methods and techniques to help you suffer fools in positions of power more kindly. You�ll encounter pearls of wisdom in the pages ahead. But, at times, you�ll need to follow a herd of swine to find them. Isn�t that how real life works? I�ll lead you through many of my own experiences so the truths will be revealed in the appropriate context. You�ll learn to reflect on your own life experiences and, in doing so, potentially make your relationship with idiots tolerable and even productive. You�ll begin by activating and enlarging your empathic capacity; thus rendering Idiot Bosses powerless to increase hostility, blood pressure, or the likelihood of homicide. I-Bosses only have as much power over your mood you allow them to have. For most, the terms empathy and idiot don�t often appear in the same thought. But, what has resentment done for you lately? Resentment causes your heart to shrivel and your veins, arteries, and capillaries to harden. While all that�s happening to you, your I-Boss�s heart is merrily pumping away, forcing oxygenated blood though veins, arteries, and capillaries as wide open and free flowing as a Los Angeles freeway at three o�clock on a Sunday morning. By sharing some of my good and not-so-good life experiences and inviting you to reflect on your own memorable and forgettable experiences, you�ll begin to see how your I-Boss came to aggravate you so much. How aggravated we allow ourselves to become is more about our own attitudes than the external persons or circumstances committing the alleged aggravating. The key to surviving and thriving without killing your boss (as the book jacket suggests) is to take control over the only thing you have control over�your emotional response to the things other people say and do as well as things that go bump in the universe. �How to Work for an Idiot� is as irreverent as it is therapeutic, as satirical as it is sensible, as lighthearted as it is heartfelt, and treats the classic hierarchical management model with all of the dignity and respect it deserves in a progressive private sector�none. Chapters like idiotspeak and idioteat are replete with tales of bungling and stumbling attempts at leadership; mostly my bungling and stumbling attempts at leadership. If I can help you become more comfortable with your frail and imperfect humanity, I�ve helped launch you on a path toward a serene and comfortable coexistence with the idiots in your personal and professional lives. With empathy comes increased tolerance, patience, and a sense of peace. Facing truths about our own flirtations with stupidity can sometimes be difficult. That�s why I�ve chosen to lace this book with wall-to-wall humor. If a spoonful of sugar helps the medicine go down, a barrel of laughs can wash down the big pills you might need to swallow. I�ve had a bitter pill of self-aggrandizement lodged in my throat for years. I gag on it to this day if I eat too fast. There is no guarantee my anecdotal approach to surviving and thriving despite your Idiot Boss will make you taller, better looking, increase your intelligence, or lose weight. I do guarantee that I write from a position of authority on the subject. If you read my biographical sketch on the jacket, you know that I hold a PhD. I also have two Master�s degrees and years of experience as a worker bee, middle manager, executive, entrepreneur, consultant, and mental health clinical intern. More important than any of that is the fact I�m an idiot. More accurately, a recovering idiot. The operative word (in case you didn�t notice) is recovery. Once an idiot, always an idiot. There is an enormous difference between an active idiot and a recovering idiot. An active idiot isn�t aware of his condition and the affect he has on others. In that state of ignorance, active idiots aren�t doing anything intentional to change. Recovering idiots are actively engaged in improving their awareness of what makes them tick and how their thoughts, words, and actions affect others. Active idiots carry their dysfunction into positions of leadership and remain oblivious to the havoc they wreak. Recovering idiots carry hope and ever-expanding awareness wherever they go, including positions of leadership. Recovering idiots are not perfect. We never will be. But, we�re working on it. Wouldn�t you like to hear your I-boss say that? My father was an extremely smart man with a very high I.Q. Yet, whenever he�d goof something up, he would mutter under his breath, �idiot.� It runs in the family. And I should have picked up on the hint long before I did. I shutter to think back on the aggravation I caused myself and others before I figured it out. But, that�s water under the bridge. Now, my checkered past is the spine of this story and a guide for your journey to idiot-immunity. Buckle up. The chapters ahead contain a rare glimpse at the inner workings of the idiot mind and reveal why the term �inner workings� is truly an oxymoron. For over a decade, I�ve written books on leadership, creativity, and organizational performance. I�ve traveled far and wide extolling the virtues of flattened organizations, collaborative leadership, and shared responsibility in the workplace. My clients welcomed me and nodded approvingly as I taught the principles of empowerment, teamwork, and open communication. They politely waited until I finished and left the building before ignoring my advice. Reading this book in a meeting when you are supposed to be paying attention is not recommended as laughing out loud can be grounds for termination. (You might be laughing at yourself, but your I-Boss won�t know the difference.) Reading this book during church sermons, funerals, or commencement speeches is not recommended if you ever want your spouse or children to speak to you again. Use caution when reading this book on an airplane. Many pilots now carry weapons. If you�re lucky enough to not get shot, you might be ushered off the aircraft by local authorities and placed on 72-hour watch at a psychiatric facility in your destination city. Do not leave �How to Work for an Idiot� lying around the office unless it�s on your worst enemy�s desk. If you ever thought the only way to survive an Idiot Boss was to medicate yourself, quit your job, or grind up your medication and lace your I-Boss�s coffee, �How to Work for an Idiot� offers hope for your spirit, strategy for your mind, and a money-back guarantee when and if Bill Gates ever files for personal bankruptcy. You are welcome to contact me through idiotworld.org and vent your spleen about your Idiot Boss, nominate an Idiot of the Month, or vent your spleen about this book. If you�re going to complain, however, I doubt you�ll be telling me anything I haven�t already heard. Writing this book isn�t the first mistake I�ve ever made.